Made at the same factory as Montecristo, H. Upmann, and Romeo y Julieta, Casa de Garcia is not your typical bundled cigar. These are made with long leaves from the Dominican Republic and Honduras, along with either buttery Connecticut, chocolaty maduro, or rich Sumatra wrapper leaves for a sub-$2 smoke that wont leave a bad taste in your mouth. Expect clean flavors, a remarkable burn, and long ashes from these affordable beauties. 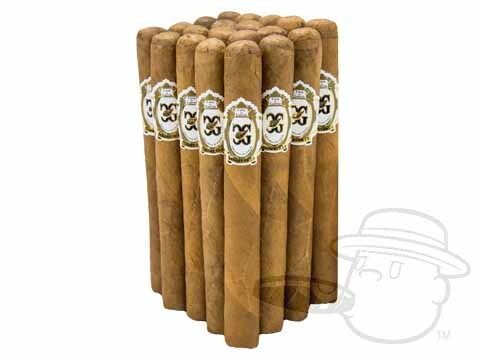 I had been purchasing these cigars at a local shop, but did not like the high price. I found your website and you had the exact cigar and at an excellent price. My order was processed quickly and arrived in a timely manner. These cigars give me the ultimate smoking experience. I will definitely purchase them again from your company. Nice comfortable cigar with an easy draw and mild good flavor. A friend turned me on to these cigars. They are light and smooth and have great smoke. And the price makes them a great value. I was very surprised by the flavor. Great value and quality made - even burn; a good daily smoker for sure. These are the best inexpensive "Bundle" cigars I have ever smoked. I like a mild smoke that draws easily. This is it. The only problem I have had with them is : They are sometimes extremely dry and need to be well moistened and humadored before smoking. This is true of most "Bundled" cigars. Consistent draw. Mild to medium strength. Quick burning. Good cigars for the price. I'm a bargain shopper and I tried these because I'm cheap. Some are good and some are ok. Smooth & Creamy all the way down. Great burn and construction. A 6 dollar cigar for 2 bucks. Hands down, thee worst cigar I have ever smoked. Purchased for family/friend to smoke. After they complained, I tried it. SMH... Bad taste, bad roll and it was stale. I have found this to be a very nice cigar for the money. It has a nice flavor and smokes on the medium to mild side. Best buy is the bundle of 20. If you gave one of these to a friend they might think you paid 10 bucks a stick. I am getting two bundles for the same price I was paying for one at my local discount store. What a great deal! Casa De Garcia Churchill Connecticut is rated 3.7 out of 5 based on 28 customer ratings.